IRI CoSort® package users get free access to a powerful graphical user interface (GUI) for SortCL job design, execution, deployment, and management called IRI Workbench. 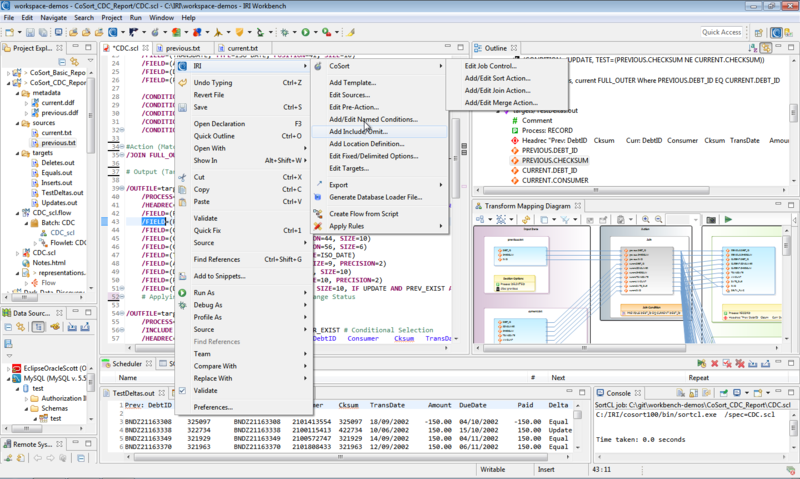 Workbench is a plug-in to the Eclipse Integrated Development Environment (IDE) that connects to, profiles, and works with the metadata in multiple data sources. The IRI Workbench provides several new functional and ergonomic features for CoSort SortCL job development, execution, and management as discussed in this section and, generally, here. In addition to managing SortCL batch or command-line task scripts, you can use Workbench to manage multi-DB SQL operations, develop Java and other applications, and work with other plug-ins like Knime for Analytics -- all in the same pane of glass.